THE PREMIUM HOME PRINTER THAT HAS IT ALL. Introducing the PIXMA TS9120 Wireless Inkjet All-In-One home printer, designed to deliver exceptional results and look great with its multiple color options. This printer can handle it all - from homework assignments, shopping lists, invitations and concert tickets to stunning family photos. Achieve photo lab results thanks to a 6-Color Individual Ink System with a Photo Blue ink for reduced graininess and even add creative filters to your photos with the 5.0" LCD Touchscreen. With all the devices we have today, printers need to be connected, and the TS9120 doesn't disappoint. With Wi-Fi®, Bluetooth, Ethernet and even Cloud3 capabilities, you can conveniently print from all your favorite devices. 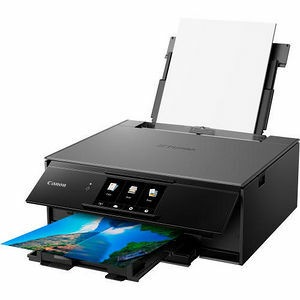 For those who want to get the most out of their printer - meet the Canon PIXMA TS9120.